Neptune Benson is pleased to announce that its newly developed electrode technology has exceeded expectation during potable water reuse demonstration testing in California. Neptune Benson, in collaboration with Carollo Engineers, took part in the nine month VenturaWaterPure project which is aimed to increase recycled water supply to meet long term demands in this California community. The objective of the overall study is to draw attention to the value of potable reuse as a renewable resource that can provide a cost-effective and sustainable source of high quality water. The State of California Division of Drinking Water (DDW) has established detailed regulations for potable water reuse. These regulations require that all indirect potable reuse plants (IPR), which inject treated water into the groundwater basin, have a UV advanced oxidation process (UV AOP) within the treatment train. The AOP process works to remove micro-contaminants, contaminants of emerging concern and (CECs) and pharmaceutical and personal care products (PPCPs). Per regulation, the AOP must provide a minimum of 0.5-log reduction of 1,4-dioxane, which is a conservative surrogate for a wide range of trace pollutants. The typical AOP utilizes UV with either hydrogen peroxide (H2O2) or sodium hypochlorite (NaOCl), with chemical dosing values of 3 to 6 mg/L. The Neptune Benson electrode has been designed to work with the ETS-UV system to provide AOP without the use of any chemical additives (hydrogen peroxide or sodium hypochlorite). The Neptune Benson approach to UV-mediated AOP is to combine an advanced electrode arrangement upstream of the UV lamps into the AOP system. The electrode consists of an anode and a cathode, and is a highly efficient method of converting TDS and other mineral salts found in most ground or surface waters into the active chlorine species, and trace amounts of hydroxyl radicals. When operating in an RO permeate, the Neptune Benson electrode will generate a copious stream of hydroxyl radicals, which are consumed by the powerful UV lamps during the AOP process. The anode and cathode work together to produce trace amounts of hydroxide (OH-) and varying ratios of hypochlorite (ClO-)/ hypochlorous acid (HOCl), depending on the pH of the water, which are in situ formed immediately upstream of the UV lamps. The electrodes use a switching power supply to remove any hard water deposits attached to them. This has the obvious benefit of not requiring the bulk storage of H2O2 on site, nor does it require the addition of quenching agents due to the inherent inefficiency of the conventional H2O2 AOP. Conventional systems that use bulk H2O2 and UV suffer from several drawbacks; the molar absorptivity of H2O2 is very low, and so few hydroxyl radicals are actually produced. Secondly those active species that are formed are typically consumed or ‘scavenged” by the H2O2. This leads to expensive quenching chemicals required to be added downstream of conventional chemically mediated AOP systems, which add cost, transport, and complexity. For more information, visit www.neptunebenson.com. Neptune Benson, an Evoqua brand, has been synonymous with water filtration and disinfection serving the municipal, industrial, and recreational water markets since 1956. Featuring award-winning brands such as the Defender® regenerative media filter, ETS-UV disinfection system, and Vortisand and Legacy™ sand filters. Neptune Benson also offers the AEGIS® anti-entrapment shield, moveable bulkheads, Dominion™ butterfly valves, ProStrainer™ and Guardian™ strainers, greendrive™ VFD systems, as well as all Lawson Aquatics accessory products. 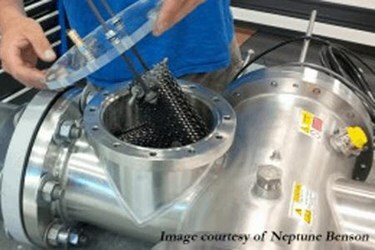 Neptune Benson has the expertise to provide effective and cost efficient solutions for a broad range of industry needs.